This contemporary, black frame is 1" wide with an overall size of 12 3/4" x 15 3/4". 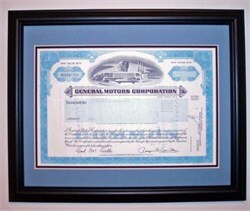 The 1970-80s modern General Motors blue stock certificate is framed with a double mat as shown in the illustration. Archival mounting, acid free backing and clear glass are used in preparing the framed certificate. Our sales price includes the historic General Motors Corp. stock certificate, packaging and USPS Priority shipment within the continental U.S.
Beautiful certificate from the General Motors Corporation issued prior to 1990. This historic document was printed by American Banknote Company and has an ornate border around it with a vignette of men with futuristic GM products. This item has the signatures of the Company's President and Secretary. General Motors Corporation, also known as GM, is the world's largest car manufacturer. Founded in 1908, in Flint, Michigan, GM employs approximately 327,000 people around the world. With global headquarters at the Renaissance Center in Detroit, Michigan, USA, GM manufactures its cars and trucks in 33 countries. In 2005, 9.17 million GM cars and trucks were sold globally under the following brands: Buick, Cadillac, Chevrolet, GMC, Daewoo, Holden, Hummer, Opel, Pontiac, Saab, Saturn and Vauxhall. GM operates a finance company, GMAC Financial Services, which offers automotive, residential and commercial financing and insurance. GM's OnStar subsidiary is a vehicle safety, security and information service provider. GM is the majority shareholder in GM Daewoo Auto & Technology Co. of South Korea and has product collaborations with Suzuki Motor Corporation, Toyota Motor Corporation and Isuzu Motors Ltd. of Japan. GM also has advanced technology collaborations with Toyota Motor Corporation of Japan, DaimlerChrysler AG and BMW AG of Germany and vehicle manufacturing ventures with Shanghai Automotive Industry Corporation of China, AutoVAZ and Avtotor of Russia and Renault of France. GM Parts and accessories are sold under the GM, GM Performance Parts, GM Goodwrench and ACDelco brands through GM Service and Parts Operations, which supplies GM dealerships and distributors worldwide. GM engines and transmissions are marketed through GM Powertrain. GM's largest national market is the United States, followed by China, Canada, the United Kingdom, and Germany. General Motors was founded in 1908 in Flint, Michigan, as a holding company for Buick, then controlled by William C. Durant, and acquired Oldsmobile later that year. The next year, Durant brought in Cadillac, Elmore, Oakland and several others. In 1909, General Motors acquired the Reliance Motor Truck Company of Owosso, Michigan, and the Rapid Motor Vehicle Company of Pontiac, Michigan, the predecessors of GMC Truck. A Rapid became the first truck to conquer Pikes Peak in 1909. Durant lost control of GM in 1910 to the company's bankers, because of the large amount of debt taken on in its acquisitions. Durant left the firm and helped establish the Chevrolet Motor Company in 1911 with brothers Gaston and Louis Chevrolet. He returned to head GM in 1916, with financing by Pierre S. du Pont. Chevrolet entered the General Motors fold in 1917; its first GM car was the 1918 Chevrolet 490. Du Pont removed Durant from management in 1920, and various Du Pont interests held large or controlling share holdings until about 1950. In 1918 GM purchased the McLaughlin Motor Car Company of Oshawa, Ontario, Canada, manufacturer of the McLaughlin-Buick automobile, and renamed it General Motors of Canada Ltd., with R.S. "Colonel Sam" McLaughlin as its first president. GM surpassed Ford Motor Company in the 1920s thanks to the leadership of Alfred Sloan. While Ford continued to refine the manufacturing process to reduce cost, Sloan was inventing new ways of managing a complex worldwide organization, while paying special attention to consumer demands. Car buyers no longer wanted the cheapest and most basic model; they wanted style, power, and prestige, which GM offered them. Thanks to consumer financing, easy monthly payments allowed far more people to buy GM cars, while Ford was moralistically opposed to credit. During the 1920s and 1930s, General Motors bought control of the Yellow Coach bus company, and helped create Greyhound bus lines. They replaced intercity train transport with buses, and established subsidiary companies to buy out streetcar companies and replace the rail-based services as well with buses. GM formed United Cities Motor Transit in 1932 (see General Motors streetcar conspiracy for additional details). General Motors bought the internal combustion engined railcar builder Electro-Motive Corporation and its engine supplier Winton Engine in 1930, renaming both as the General Motors Electro-Motive Division. Over the next twenty years, diesel-powered locomotives � the majority built by GM � largely replaced other forms of traction on American railroads. (During World War II, these engines were also important in American submarines and destroyer escorts.) Electro-Motive was sold in early 2005. General Motors produced vast quantities of armaments, vehicles and even aircraft during World War II. During the war, the U.S. auto companies were concerned that the Nazis would nationalize American owned factories in Germany. In the spring of 1939, the Nazis had assumed day to day control of American owned factories in Germany, but decided against nationalizing them. GM's William P. Knudson served as head of U.S. wartime production for President Franklin Roosevelt who had referred to Detroit as the Arsenal of Democracy. Today, Detroit is the headquarters for the U.S. Army Tank-Automotive and Armaments Command, known as TACOM. American GM Vice President Graeme K. Howard (later colonel Graeme K. Howard) was a committed Nazi, with such views expressed in his book, America and the New World Order. Adolf Hitler awarded GM boss James D. Mooney the Order of Merit of the Golden Eagle for his services to Nazi Germany. General Motors� internal documents show a clear strategy to profit from their German military contracts even after the outbreak of war between America and Germany. Defending the German investment strategy as �highly profitable�, GM�s Alfred P. Sloan told shareholders in 1939 that GM�s continued industrial production for the Nazi government was merely sound business practice. In a letter to a concerned shareholder, Sloan said that the manner in which the Nazi government ran Germany "should not be considered the business of the management of General Motors...We must conduct ourselves as a German organization. . . We have no right to shut down the plant." At one point GM had become the largest corporation registered in the United States, in terms of its revenues as a percent of GDP. In 1953, Charles Erwin Wilson, then GM president, was named by Eisenhower as Secretary of Defense. When he was asked during the hearings before the Senate Armed Services Committee if as secretary of defense he could make a decision adverse to the interests of General Motors, Wilson answered affirmatively but added that he could not conceive of such a situation "because for years I thought what was good for the country was good for General Motors and vice versa". Later this statement was often misquoted, suggesting that Wilson had said simply, "What's good for General Motors is good for the country." At the time, GM was one of the largest employers in the world � only Soviet state industries employed more people. On December 31, 1955, General Motors became the first American corporation to make over one billion dollars in a year. Roger Bonham Smith (born July 12, 1925) was the Chairman and CEO of General Motors from 1981 to 1990. Born in Columbus, Ohio, Smith earned his MBA at the University of Michigan Business School after serving in the United States Navy. He worked his way up the GM financial management team to become corporate treasurer in 1970, vice president of finance in 1971, executive vice president for finance and public relations, and a member of the board of directors in 1974. Roger Smith seemed to be the last of the old-line GM Chairmen, a conservative, anonymous bureaucrat, resisting change. However, propelled by industry and market conditions, Smith oversaw some of the most fundamental change in GM's history, although his tenure is commonly viewed as a failure. When Smith took over GM, it was reeling from its first annual loss since the early 1920s. Its reputation had been tarnished by lawsuits, persistent quality problems, bad labor relations, public protests over the installation of Chevrolet engines in Oldsmobiles and by a poorly designed diesel engine. Smith made sweeping changes at GM, which was losing market share to foreign automakers for the first time. He instituted several initiatives that included forming strategic joint ventures with Japanese and Korean automakers, launching the Saturn division, investing heavily in technological automation and robotics, and attempting to rid the company of its risk-averse bureaucracy. Smith's transformation failed to earn consistent profits for GM, while its share of the US market fell from 46% to 35%. Smith began the reorganization of GM that would define his chairmanship, with the 1981 creation of the worldwide Truck and Bus Group, consolidating the design, manufacture, sales and service of all trucks, buses and vans under one umbrella. 1982 saw the creation of the Truck and Bus Manufacturing Division, which combined all truck manufacturing and assembly operations from their former divisions, but still a separate bureaucracy from that of the Truck and Bus Group. In 1982 Smith negotiated contract concessions with the United Auto Workers and cut planned raises for white-collar workers. After unveiling a more generous bonus program for top executives provoked an angry response from the union, Smith was forced to back-pedal. Relations with the UAW, management, and stockholders remained strained. Profits improved in 1983 and Smith began unveiling his vision for reorganization, diversification, and "reindustrialization." One of the most controversial decisions made during Smith's tenure was the partial elimination of divisional autonomy in 1984. In the 1920s, Chairman and CEO Alfred Sloan, Jr. had established semi-autonomous divisions within the corporation, each designing and marketing their own vehicles (Chevrolet, Pontiac, Oldsmobile, Buick and Cadillac). This was considered a crucial factor propelling GM past market leader Ford in the 1930s. By the 1980s however, that autonomy (also including Fisher Body division producing the car bodies, and GM Assembly division building them) represented a dated business model and had led to needless large scale redundancy, infighting by the divisions, and a bloated internal bureaucracy. Smith took on the massive GM bureaucracy with disastrous results. A sea change in how GM would market and build cars in the future, the 1984 reorganization was intended to streamline the process and create greater efficiencies; the reverse actually occurred. Combining the nameplate divisions, Fisher Body, and GM Assembly into two groups C-P-C (Chevrolet, Pontiac, Canada) to build small cars, and B-O-C (Buick, Olds, Cadillac) to build large cars, the effort was subsequently criticized for creating chaos within the company. Longstanding informal relationships that greased the wheels of GM were severed, seemingly overnight, leading to confusion and slipping new product programs. The reorganization virtually stopped GM in its tracks for 18 months, and never really worked as intended, with the CPC division building Cadillacs and BOC building Pontiacs. The reorganization added costs and created more layers of bureaucracy when the new Groups added management, marketing and engineering staff, duplicating existing staff at both the corporate and division levels. Almost ten years elapsed before the 1984 reorganization was unwound and all car groups were combined into one division. By the 1990s, GM's program of sharing components across divisions that began in the 70s as a way to cut costs grew into a marketing problem. After the 1984 reorganization forced teamwork by the divisions, parts sharing evolved into wholesale sharing of entire designs and simply re-badging vehicles for each division. Observers suggested that differences between automobiles produced and marketed by the Chevy, Buick, and Oldsmobile divisions were less distinct as a consequence. Automotive commentators cited a lack of a distinct brand identity and demographic changes as crucial factors in the demise of the Oldsmobile division in 2004. Compounding GM's problems was the fact that while entire platforms shared designs, the engineered parts beneath the surface, where customers didn't care or didn't notice were often not shared, which is where money could be saved. Analyst David Cole summed it up: "The engineering was 180 degrees out of phase. GM cars looked alike outside but were all different inside." After GM's massive lay-offs hit Flint, Michigan, a strike began at the General Motors parts factory in Flint on June 5, 1998, which quickly spread to five other assembly plants and lasted seven weeks. Because of the significant role GM plays in the United States, the strikes and temporary idling of many plants noticeably showed in national economic observations. In the late 1990s, GM had regained market share; its stock had soared to over $80 a share by 2000. However, in 2001, the stock market drop following the September 11, 2001 attacks, combined with historic pension underfunding, caused a severe pension and benefit fund crisis at GM and many other American companies and the value of their pension funds plummeted. A weak U.S. dollar and private health care (as opposed to nationalized health care in other countries) costs also put GM at a disadvantage to its Japanese, Korean, and European counterparts. In successive moves, GM responded to the crisis by fully funding its pension fund; however, its Other Post Employment Benefits Fund (OPEB) became a serious issue resulting in downgrades to its bond rating in 2005. The company expressed its disagreement with these bond rating downgrades. In 2006, GM responded by offering buyouts to hourly workers to reduce future liability; over 35,000 workers responded to the offer, well exceeding the company's goal. GM has gained higher rates of return on its benefit funds as a part of the solution. Stock value has begun to rebound - as of October 30, 2006 GM's market capitalization was about $19.19 billion. GM stock began the year 2006 at $19 a share, near its lowest level since 1982, as many on Wall Street figured the ailing automaker was bound for bankruptcy court. But GM is still afloat. The company's stock in the Dow Jones industrial average has posted the biggest percentage gain in 2006.. Since 2000, GM has remained the world's largest auto maker, ranked according to sales. After oil company mergers, GM's rank changed to the 5th largest company in the United States and the world in terms of sales. On June 30, 2006, Kirk Kerkorian, whose Tracinda Corporation was the third-largest shareholder of General Motors, proposed a failed deal for an alliance between GM and Renault & Nissan. Tracinda has since sold off its interest in General Motors. GM acquires Electronic Data Systems Corporation (EDS), in 1984 as one of the leading data processing and telecommunications companies in the world. Hughes Electronics was formed in 1985 when Hughes Aircraft was sold by the Howard Hughes Medical Institute to GM for $5.2 billion. GM merged Hughes Aircraft with its Delco Electronics unit to form Hughes Electronics. This division was a major aeropace and defense contractor, civilian space systems manufacturer and communications company. The aerospace/defense business was sold to Raytheon in 1997 and the Space and Communications division was sold to Boeing in 2000. General Motors acquires Hughes Aircraft Company, regarded as one of the leading defense electronics firms in the world. It is to remain independently managed as a subsidiary of Hughes Electronics Corporation - a new wholly-owned subsidiary of General Motors. Delco Electronics Corporation becomes a subsidiary of Hughes Electronics Corporation. General Motors still owns part of the Hughes Research Laboratories, which is now co-owned by Boeing, General Motors, and Raytheon. General Motors has an extensive history in numerous forms of racing. Vehicles of most, if not all, of GM's brands have been represented in competition, with perhaps Chevrolet being the most prominent. In particular, the Chevrolet Corvette has long been popular and successful in international road racing. GM also is a supplier of racing components, such as engines, transmissions, and electronics. GM's Oldsmobile Aurora engine platform was successful in open-wheel Indy-style racing throughout the 1990s, winning many races in the small V-8 class. An unmodified Aurora V-8 in the Aerotech, captured 47 world records, including the record for speed endurance in the Motorsports Hall of Fame of America. Recently, the Cadillac V-Series has entered motorsports racing. GM has also used many cars in the American racing series NASCAR. Currently the Chevrolet Monte Carlo is the only entry in the series but in the past the Pontiac Grand Prix, Buick Regal, Oldsmobile Cutlass, Chevrolet Lumina and Chevrolet Malibu were also used. In touring cars (mainly in Europe) Vauxhall is a key player and former champion in the British Touring Car Championship (BTCC) series and competes with a Vauxhall Astra VXR in BTC spec. Opel is one of the three participants in the DTM series (along with Audi and Mercedes Benz) and is a former champion and competes with a unique 500 bhp vehicle that resmbles the Opel Vectra. Chevrolet competes with a Lacetti in the FIA World Touring Car Championship (WTCC). In Australia, there is the prestigious V8 Supercar Championship which is battled out by the two main rivals of Holden& Ford. The current Holden Racing Team cars are based on the Holden Commodore and run a 5.0-litre V8-cylinder engine producing 600+BHP (approx 500Kw Power) @ 7500rpm). These cars have a top speed of 300+km/h (200mph) and run 0-100km/h in less than 4 seconds. In 2006, The Holden Racing Team again carried the mantle as Australia's most successful team in Australian Touring Car History.